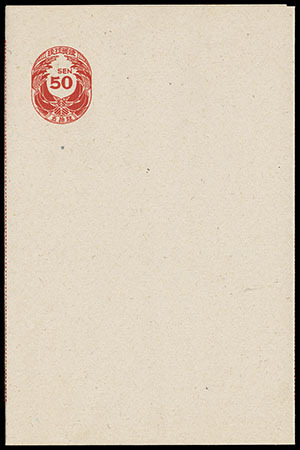 Ryukyus, Letter Sheet, 1948, Deigo Blossom, 50s orange red on gray, 1st printing, bright and fresh, vertical crease in back portion of sheet, otherwise Very Fine, very scarce. JSDA No. LS1A. 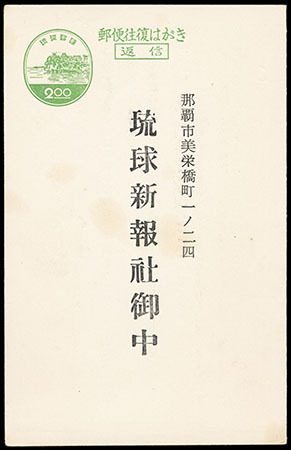 Ryukyus, Postal Card, 1958, 1½¢ on 2y green, type C, ¢ omitted, canceled by neat 1959 town cancel, Very Fine and scarce. JSDA No. PC21C var. 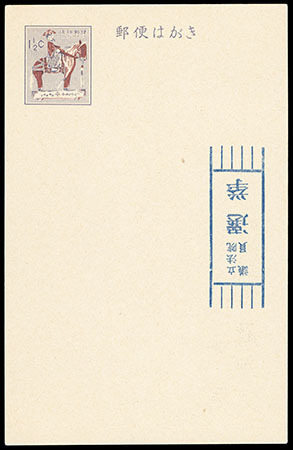 Ryukyus, New Year Postal Card, 1961, 1½¢, for 1962, red omitted, mint entire, with dramatic offset and extraneous patterning on reverse, Very Fine. JSDA No. NC7 var. 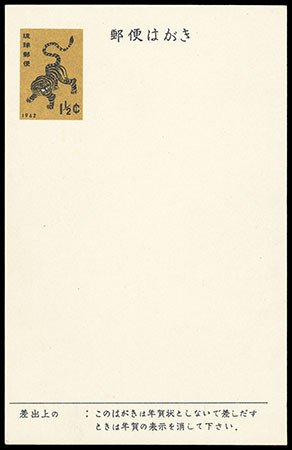 Ryukyus, Postal Card, 1971, "Kai Tei" (revalued) 2¢ surcharge on 1½¢ Toy Pony, inverted surcharges, two mint cards; includes normal surcharge inverted and surcharge on reverse inverted, both Very Fine; with 2002 R.P.S.S. certificate for UX42a. Scott No. UX42a, UX42e $1,000. 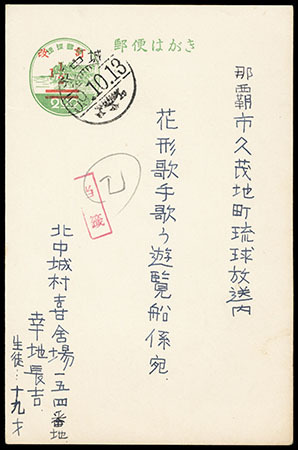 Ryukyus, Paid Reply Postal Card, 1948, 10s+10s dull red on grayish tan, unsevered, bright and fresh, couple light corner bends at top left, still Very Fine. JSDA No. PC2. 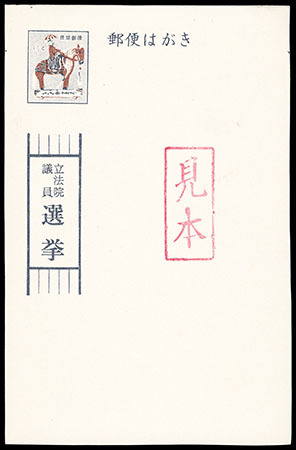 Ryukyus, Paid Reply Postal Card, 1951, 85s handstamped surcharge type "a" on 15s+15s vermilion on gray, unsevered, two mint cards, on gray and tan card stock, Very Fine, very scarce on gray stock. Scott No. UY4m, UY4o $1,810. 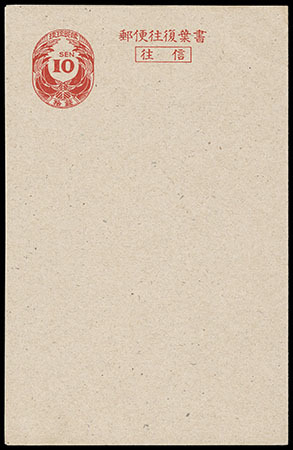 Ryukyus, Paid Reply Postal Card, 1951, 85s handstamped surcharge type "d" on 15s+15s vermilion, unsevered, two mint cards, on gray and tan card stock, Very Fine, very scarce on gray stock. Scott No. UY4n, UY4q $1,560. 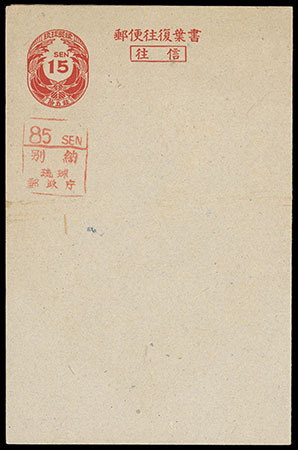 Ryukyus, Paid Reply Postal Card, 1958, 1½¢ surcharge on 2y+2y green, unsevered, surcharge on message card only, pre-printed card canceled "Naha Chuo, Aug 5, 1959" cds on message side, reply side unused; some minor light card spots, Very Fine, the only known used example of this error. JSDA No. 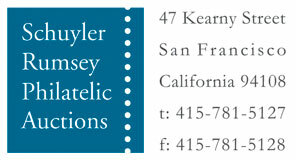 PC22 var. Scott No. UY11b Estimate $200 - 300. 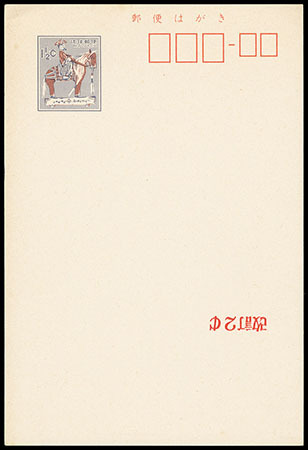 Ryukyus, Postal Card - Official Election, 1960, 1½¢ indigo & claret brown, red Mihon chop overprint, showing a few pencil separation guideline dots at edges, Very Fine, very rare, ex-Schoberlin. Scott No. UZE15S Estimate $300 - 400. 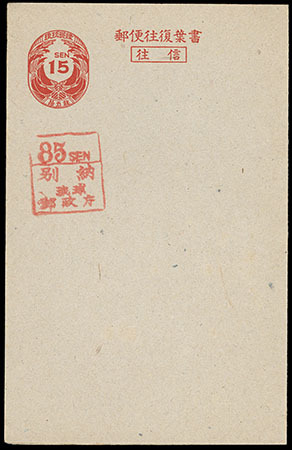 Ryukyus, Postal Card - Official Election, 1962, 1½¢ violet gray and claret brown, election indicium inverted at right side of card, 6th general election card bearing Hideo Chibana's printed message on reverse, Very Fine and rare, listed but unpriced in Scott; with 1997 R.P.S.S. certificate. Scott No. UZE17b Estimate $300 - 400.